Want to quickly see how the open-source software ALPHA CMS works? 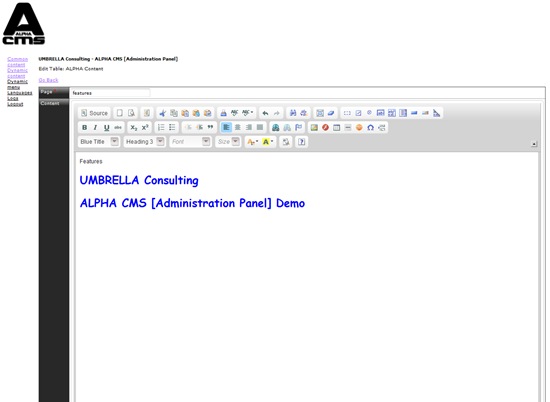 You'll find a free and updated demo installation of ALPHA CMS here. We are currently updating the ALPHA CMS demo. Please check back shortly. There will be a new version up soon. If you want to get a more comprehensive review of Alpha CMS you can download the project from SourceForge and set up your own Alpha CMS demo. The screenshots below will give you a preview of how an admin demo looks like and how you can customize your online demo through themes. Alpha CMS is AJAX based and offers support for HTML 5 and CSS 3.0, allowing you to use any template engine as an extension. The project was first registered on SourceForge on February 23, 2009 and since then its community has been working on improving its features. The latest version available for download is 11.0 and was released on November 19, 2014.